At this year's annual kickoff, the Slider team had the chance to blow off steam and laugh until our cheeks hurt with improv training. Goofy? Yes. A little intimidating? Certainly. But I'm not sure any of us anticipated how empowering and relevant it would also be. As we now know, improv sharpens communication skills, creativity, and presentation skills. It also improves teamwork and helps to create a positive work environment. What better way to start the year? Here are some practical improv-based learning of what we took away from the training. 1. Tend towards embracing others' ideas. Megan, Samantha, and Erin pose as we pretend to be a vacationer's photo. If there's one thing that great designers, product managers, and business strategists have in common, it's thinking ahead. Sometimes it's easy for us to imagine all the ways an idea can go wrong. But kneejerk dismissals - especially those delivered by leaders - can throttle innovation. The "no"s and "but"s stop the flow of ideas, and encourage smart people to self-censor rather than to share openly. 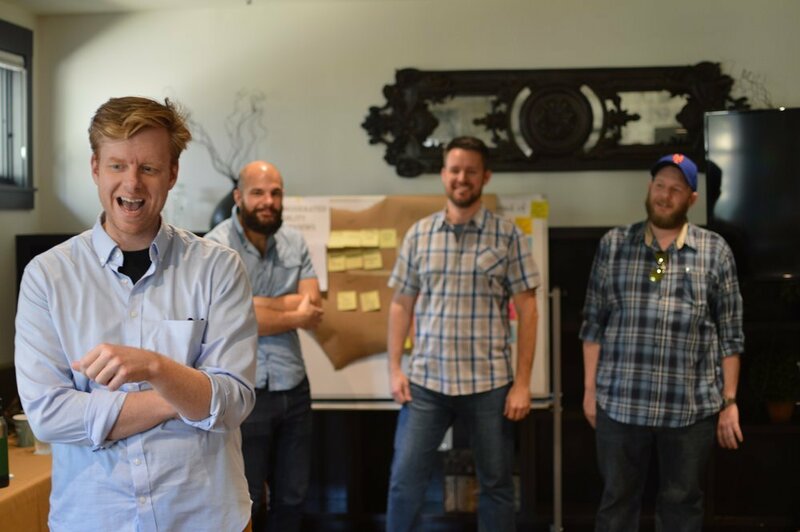 When we practice the "Yes, and" guideline from improv, we encourage our peers to share their wildest ideas. See a problem with their idea? Try to work it in with an "And" instead of a "But", and see how it changes the conversation. 2. Listen and repeat back. Have you ever delivered just the right response to something you thought someone said, only to learn in the end that you misunderstood them? By repeating back what you heard before you respond, you do two things. First, you show the other person that you heard them. Second, you allow their idea to sink in a little bit deeper. That buys you time to consider your thoughts a little more, and helps to ensure that your next contribution truly adds to the discussion. Hanna and Chad describe their vacation together after a recent breakup. Adam, Brant, and Travis listen as our instructor explains the activity. 3. Be willing to serve as the connective tissue. One warmup activity we did was storytelling in the round. In a big circle, we went one after the other, each adding a single word as we built a (nonsensical) story together. During the activity, the trainer complimented our teamwork: "In some groups, everyone wants to be the one with the the big ideas. But you guys were willing to use your turns to put in the basic words - the 'the's and 'and's - that make a story make sense." You don't always have to be the one with the big idea. Sometimes your team just needs someone to connect the ideas, so they start to make sense together. That job is important, too. Chris & Lindsay play fellow history teachers from rival schools. 4. Things turn out better when you go with the flow. Our trainer explained that the best improve shows are the ones where no one tries too hard to force the funny. The humor, he said, comes naturally when we just follow the guidelines and go with the flow. The same is true for our careers and aspirations. If you cling too tightly to your own vision for something, you might miss a tremendous opportunity that you would have never predicted. Chance opportunities have helped my career and our business too many times to count. Some of the biggest breakthroughs were totally unexpected, and we may have missed them if we had been too focused on making something else work. Have you seen workplace benefits from improv training, or other team building activities? Tell us more!